Announcing the 2019 M1D Commemorative Poster! 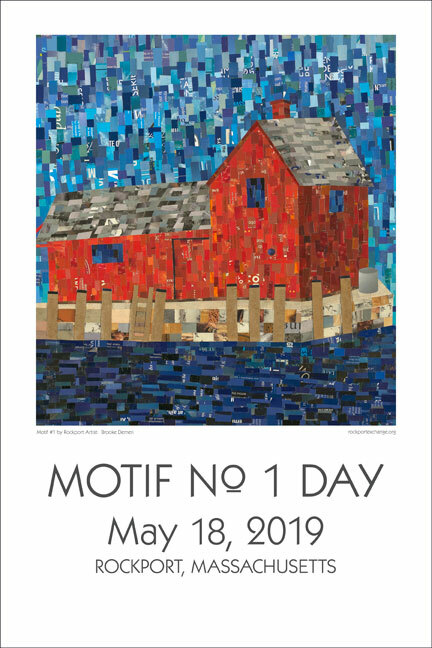 Rockport Exchange is pleased to announce that Brooke Demeri is the featured artist for the 2019 Motif No.1 Day Festival commemorative poster. Brooke is a student at Rockport High School. As the daughter of Lisa Demeri, niece of Jill Demeri, and granddaughter of Dominic Demeri, she is a third-generation Rockport artist. To feature Brooke as the 2019 artist is exciting in another sense: she also created the artwork for the 2009 Motif No.1 Day Festival poster as a young girl of 8. A decade later, it seems especially fitting to have her work featured on the M1D poster as Brooke continues to grow and develop in the tradition of Rockport artists. The nonprofit Rockport Exchange organizes and funds the Motif No.1 Day Festival — the annual celebration of Rockport’s iconic fishing shack as inspiring artists for over one hundred years. Your support for Rockport Exchange in its work to carry on the tradition of the Motif No.1 Day is appreciated. Your purchase of the commemorative poster funds the community initiatives of Rockport Exchange. To purchase the poster, head over HERE, and thank you!